He is Professor of Clinical Cardiology and Consultant Cardiologist at Guys and St Thomas Hospital where he is Head of Noninvasive Cardiology. He specialises in heart valve disease and echocardiography, but also advises on cardiovascular fitness before non-cardiac surgery including renal transplantation. He was President of the British Society of Echocardiography between 2003 and 2005 and is currently President of the British Heart Valve Society. 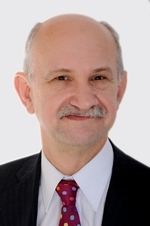 He has been involved in setting up national accreditation systems for individuals and departments in standard echocardiography and is co-author of international guidelines for the echocardiography of heart valve obstruction and artificial heart valves. He has written several books on echocardiography and is co-author of a book on Acute Medicine currently in its 4th edition. His research is mainly in the optimal timing of surgery in heart valve disease.